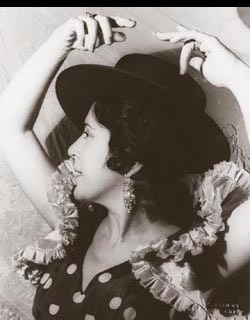 In 1927 Argentinita formed her own gypsy dance troupe, which toured France and Latin America performing flamenco and traditional gypsy dances. Around the same time, she and the poet Federico García Lorca recorded Spanish folk songs, with Lorca playing the piano and Argentinita singing. In 1932 she and Lorca established the Madrid Ballet, which was intended to preserve old-style gypsy dancing. With the onset of the Spanish Civil War and the execution of Lorca, Argentinita left Spain in 1937. She made a disastrous U.S. debut in 1930 when she performed in Lew Leslie’s International Revue. The presentation of Argentinita’s piece was conditioned by stereotypes about Spain, as well as by contemporary theatrical tastes. Set against a flashy backdrop and chorus girls wearing Broadway-style Spanish dresses, Argentinita’s authentic dress and intimate, understated dancing style failed to impress the New York theater public.